T Kira Madden is a queer APIA writer, photographer, and amateur magician living in New York City. 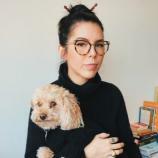 She holds an MFA in creative writing from Sarah Lawrence College and an BA in design and literature from Parsons School of Design and Eugene Lang College. She is the founding Editor-in-chief of No Tokens, a magazine of literature and art, and is a 2017 NYSCA/NYFA Artist Fellow in nonfiction literature from the New York Foundation for the Arts. She has received fellowships from The MacDowell Colony, Hedgebrook, Tin House, DISQUIET, Summer Literary Seminars, and Yaddo, where she was selected for the 2017 Linda Collins Endowed Residency Award. Her debut memoir is LONG LIVE THE TRIBE OF FATHERLESS GIRLS. She facilitates writing workshops for homeless and formerly incarcerated individuals and currently teaches at Sarah Lawrence College. There is no period in her name. Acclaimed literary essayist T Kira Madden's debut memoir is about coming of age and reckoning with desire as a queer, biracial teenager amidst the fierce contradictions of Boca Raton, Florida, a place where she found cult-like privilege, shocking racial disparities, rampant white-collar crime, and powerfully destructive standards of beauty hiding in plain sight. As a child, Madden lived a life of extravagance, but under the surface was a wild instability. The only child of parents continually battling drug and alcohol addictions, Madden confronted her environment alone. Facing a culture of assault and objectification, she found lifelines in the desperately loving friendships of fatherless girls.